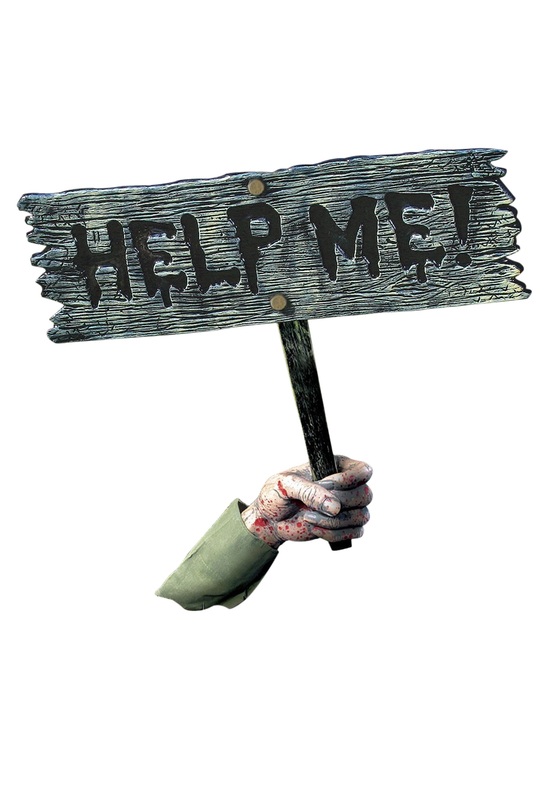 6" x 18" molded plastic sign looks like weathered wood, reads "HELP ME!" If you see one of these where you didn't place it, for Pete's sake, get digging!!! Have you heard about those coffins you can get that have a bell attached to them that sticks out of the ground? It's supposedly so if you accidentally get buried alive, you can ring the bell and they will dig you back up. But, we think it's actually so if a mouse or something eventually gets into your casket, it might pull on the cord, and you can get in one last practical joke from the afterlife. A much more direct approach to dealing with being buried alive by accident would be if you could poke an arm out of the dirt, and wave a sign to get help. That is exactly what trick-or-treaters are going to think is going on when they see this Help Me Arm and Sign decoration poking out of your lawn. The plastic sign and sign post slides into the gripping plastic hand, which stakes into the ground wherever you want to make it look like you've unwittingly buried your pre-deceased victim. This goes great as part of a decorative scene, or as a spooky standalone prop!